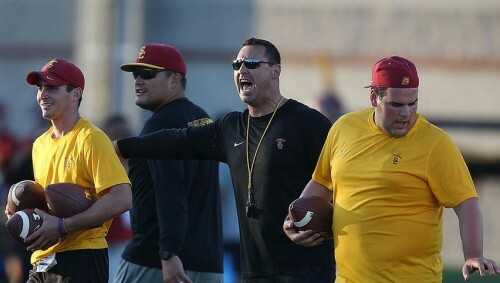 Steve Sarkisian is trying to clean up some things surrounding his USC program, and that seems to include banning the players parents from practice now. Citing a desire to eliminate outside distractions for players, USC informed parents earlier this month that they wouldn’t be allowed to attend practices after Aug. 22. The ban came before Sark’s drunken incident at an event over the weekend. “I just felt like it was the best interest for our football team,” Sarkisian said Wednesday. “I want to give our players the best chance to come out here every day, perform really well and not worry about any outside distractions, be able to come over to you guys and express themselves in a positive light, and when it’s done, if they want to go have breakfast or lunch with their parents, that’s great. USC parents have previously been allowed to attend practice for years. Sarkisian says he felt like the decision was for the betterment of the program.